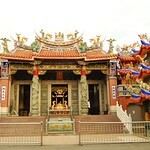 When the Chen family from Quanzhou immigrated to Taiwan in 1785, they simultaneously also invited the guardian deity, Qingshan King, from hometown to Taiwan. It is worshipped in the lobby of Chen’s mansion. It was worshipped by the local people of Beishi keng. Due to the strong power of the deity, the numbers of apprentices increased throughout the neighborhood. Therefore, the country gentleman suggested building a temple. In 1788, the temple was built by mud and willow. It was the earliest Qingshan King temple. There were Chief king, second King and the third King deities. Because of the new planning of Zhonggang special district, and the road passing through the temple area, the temple was relocated at the current address. The main resident deity is Qingshan King, and the subsidiary deities are Shennong deity(divine of farmer),Earth God, and Zhongtan Yuanshuai. The temple became the central belief of the local people of Beishikeng, and also the evidence of the early settlement of the Quanzhou immigrants.